Welcome to our site where you can get information and great deals on Western, Antique and custom cowboy spurs. Please Like our new Facebook page for more information and to speak to fellow Cowboy Spurs lovers. 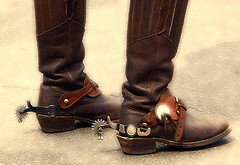 Western spurs are one of the most recognizable items in a Cowboys equipment. Not just a handy tool for steering your steed whilst driving cattle thousands of miles across the open American countryside, the spur is now a hot western wear and western jewelry fashion item worn by people of all walks and ages all over the world. Because cowboy boots with a spur fitten are such a personal piece of equipment and because they are handmade, they have rapidly become very representative of the Cowboy ethos in America. This makes them a desirable and collectible item in the field of American Western Memorabilia. Americans love affair with the Spur began with the Spanish, dating back to the introduction of the spur to their continent by the Conquistador, Hernando Cortez in 1520. In early history the size of the rowel could be up to 6 to 8 inches in diameter. For generations, these items have been constantly modified to adapt to the individual needs of the Cowboy. Cap guards, tie-downs, jinglebobs and rowel guards were all invented and added because of the need for increased safety and for the better use of spurs - and sometimes just for adding that something special to the design. Browse this section to find items from makers and manufacturers such as the Kelly Bit and Spur Company, Renalde, Crockett Spurs, North and Judd and Buermann are all historic names associated with Cowboy Spurs and the old time American west. Modern western spurs are just as collectible as those made by the companies of old. Kids spurs and ladies spurs are also popular choices for the Cowboys of today. There are many cowboy spurs books that have been written on the history of the spur, their makers and designs. You can also lay you hands on copies of the old western spurs catalogs produced by the makers to sell their wares. Not all spurs are made equal. Those made by the historic designers such as Crockett and Renalde are timeless pieces of western memorabilia - but sometimes you just want something special. A set of hand made custom spurs are the answer. We all like our Cowgirls to look pretty when we step in from a hard days work on the ranch. We also like them to look nice when we take them out. Buy your loved one a pair of boots to go with her western show clothing that will put the finishing touches to her outfit. Although we are not experts, we have lots of information and experience with examining spurs. If you would like information about any spurs you have or would just like to say hello, please join our brand new Facebook page.